FILE - A ship-to-shore crane prepares to load a 40-foot shipping container onto a container ship at the Port of Savannah in Savannah, Georgia, July 5, 2018. As the trade war between the world's two largest economies nears the end of its first week, its most unsettling fact may be this: No one seems to foresee any clear path to peace. The United States insists that China abandon the brass-knuckles tactics it's used to try to supplant America's technological dominance. Yet Beijing isn't about to drop its zeal to acquire the technology it sees as crucial to its prosperity. Having run for the White House on a vow to force China to reform its trade policies, President Donald Trump won't likely yield to vague promises by Beijing to improve its behavior — or to pledges to buy more American soybeans or liquefied natural gas. "It certainly feels like we're in for a protracted fight," said Timothy Keeler of the law firm Mayer Brown and a former chief of staff at the Office of the U.S. Trade Representative. "Truthfully, I don't know what the off-ramp is." The two countries have targeted an additional $16 billion worth of each other's products for a second round of25 percent tariffs. On Tuesday, the Office of the U.S. Trade Representative proposed 10 percent tariffs on another $200 billion in Chinese imports, ranging from fish sticks to burglar alarms. All told, Trump has threatened eventually to slap tariffs on up to $550 billion in Chinese imports — more than China actually exported to the United States last year — if Beijing won't relent to U.S. pressure and continues to retaliate. At the heart of the dispute: The Trump administration's complaints that China has used predatory practices in a relentless push to grant Chinese companies an unfair advantage in the industries of the future, including robotics, electric cars and biopharmaceuticals. These tactics include the outright theft of trade secrets, government subsidies to homegrown tech firms and demands that U.S. and other foreign companies hand over technology if they want access to China's vast market. Eliminating the new tariffs will prove a lot harder than it was to raise them in the first place, said Wendy Cutler, a former U.S. trade negotiator who is a vice president at the Asia Society Policy Institute. "Both sides have too much at stake and don't want to back down." And China's benchmark stock index — the Shanghai Composite — has dropped 15 percent this year, at least partly on fears about damage from the trade conflict with Washington. "It's a dicey time for the Chinese economy," said Claude Barfield, a resident scholar at the conservative American Enterprise Institute and former consultant to the U.S. Trade Representative. The Yang Ming shipping line container ship Ym Utmost is unloaded at the Port of Oakland, July 2, 2018, in Oakland, California. So it's possible that economic pressure could persuade Beijing to cave. Yet many analysts are skeptical. Eswar Prasad, an economist at Cornell University, said the economic damage from U.S. tariffs is "likely to be muted since China has enough room to forestall a growth slowdown" by increasing government spending or adopting easy-money policies that put more cash into the economy. Mary Lovely, an economist and trade expert at Syracuse University, says it's unclear how China could appease Trump, even if it wanted to. China has pledged in the past to police cyber-theft and end coerced technology transfers. So any negotiations, Lovely said, would raise more questions: Would the Trump administration accept another promise? How would any promise be verified? How long would it take to determine whether Beijing has actually reformed its ways? And China's leaders might prove reluctant to back down and risk a backlash from the public. "They have nothing to gain internally by kowtowing to President Trump, and that's exactly what it would be," Lovely said. Trump faces pressures, too. The Chinese designed their tariffs to inflict political pain in the United States. They have, for example, targeted soybeans and other farm products in a shot at Trump supporters in the American heartland. And U.S. farmers are represented by trade groups and congressional delegations who aren't shy about attacking U.S. policies that threaten farm incomes. 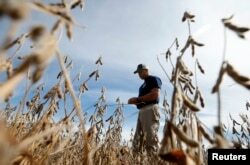 Ryan Roberts walks through a soy bean field to check if it is ready for harvest in Minooka, Illinois, Sept. 24, 2014. Corn and soybean prices have been depressed by concerns about trade tariffs and the increased cost of farm equipment. But the president would also find it hard to back down. He's already considered one possible solution only to back away from it. In May, Treasury Secretary Steven Mnuchin announced after a meeting with the Chinese that the trade war was "on hold" and the tariffs suspended after Beijing agreed to reduce the U.S. trade deficit by buying more American energy and farm products. "The president felt the sting of that and didn't like that," Keeler said. So the administration decided to "drive a harder bargain," and it revived — and ramped up — its tariff threat. Taiya Smith, a former Treasury official who handled negotiations with China, says it's possible a deal could be reached in which Beijing ends its predatory practices but can still keep itself competitive in advanced industries. The key, she says, is persuading China that its tech companies don't need massive assistance from the state. "Their companies are becoming very powerful," Smith said. "They have to be willing to compete on a level playing field. They no longer need a leg up." "The Chinese have to have a political win somewhere in there, too," Smith said. "You can't design something where we get what we want and China gets nothing. They have their own politics." Scott Paul, president of the Alliance for American Manufacturing and a sharp critic of Beijing's trade practices, wants to see the tariffs remain until either U.S. companies leave China or Beijing opens its market wider to American goods and investment. "They should stay on for long enough that they manifest some change," he said. "I don't see the tariffs coming off anytime soon." "We have waste cans full of promises by the Chinese government to reform its anti-competitive practices that are completely ignored," he said. "The tariffs are the best and only leverage that we have with China, and we would be foolish to squander them without major gains."